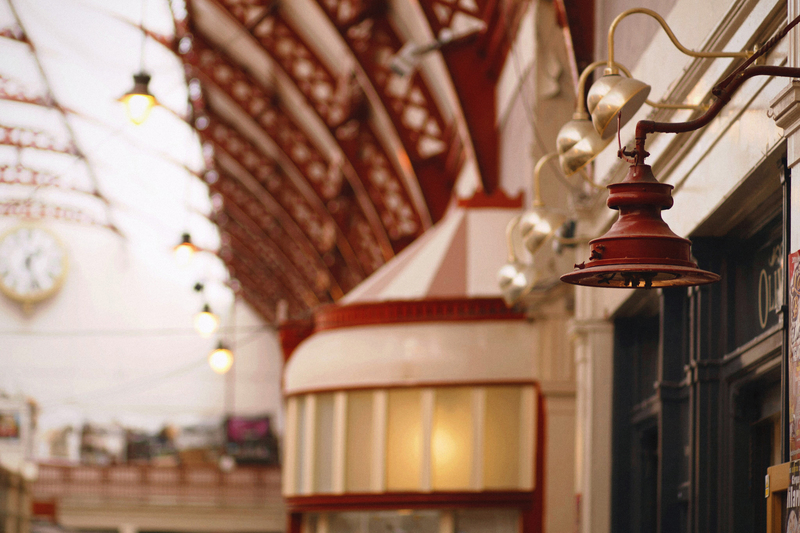 Here’s a little glimpse of Grainger Market on a lovely Saturday morning! 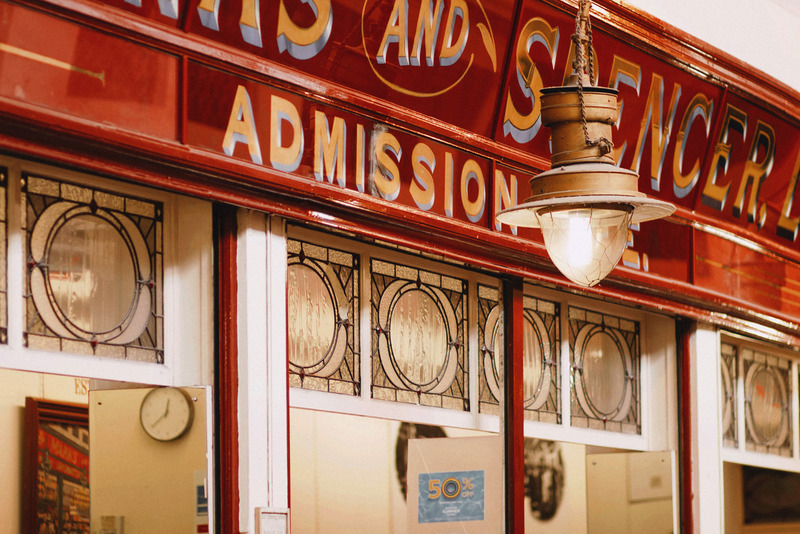 This Victorian era marketplace is a Newcastle icon and for good reason – it’s quaint but bustling, charming in its period architecture and still the best place to shop for local meat and veg! 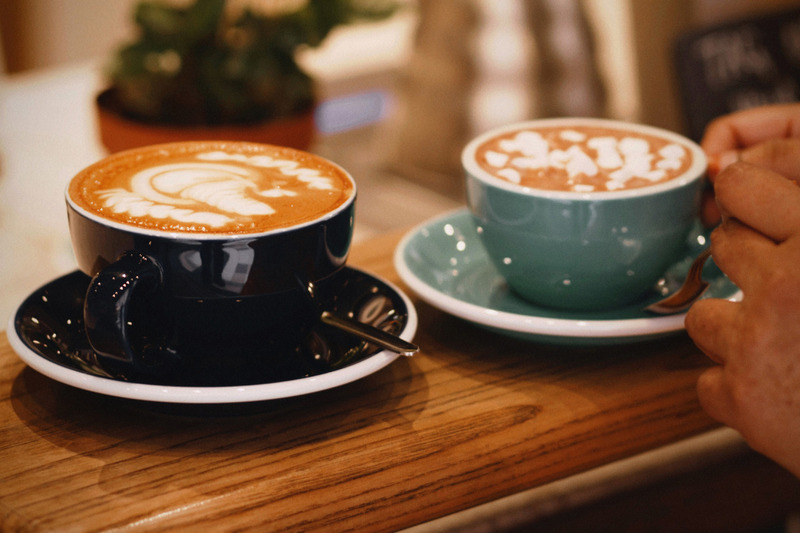 We started the morning with coffee at Pumphrey’s Coffee Shop, a North East institution in its own right. My hot chocolate with marshmallows was fantastic, although it did cool down a little while I was posing with it for photos! I got so many compliments on my outfit from complete strangers – it’s one thing I love about living in the North, how absolutely friendly everyone is! It’s genuinely heartwarming. Plus size fashion blogger Ragini of A Curious Fancy at Marks and Spencer in Grainger Market, Newcastle. 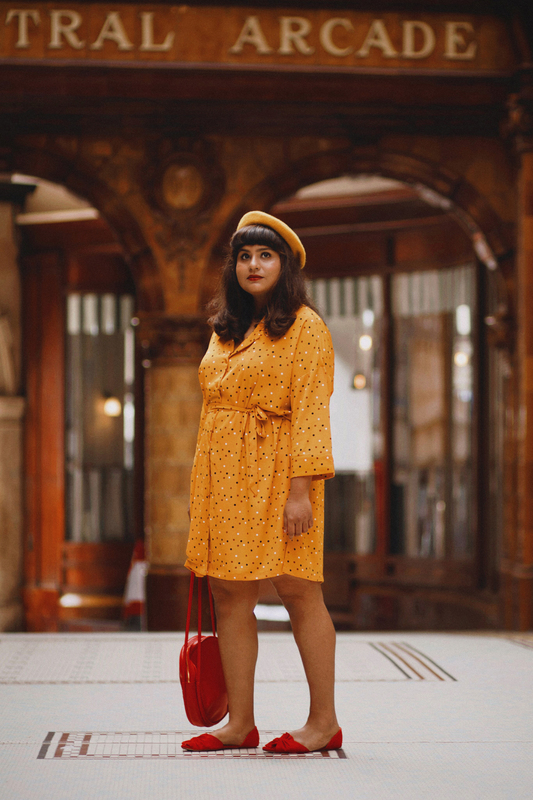 She’s wearing a mustard yellow polka dot shirt dress, mustard yellow beret and red flats. She’s carrying a red circle bag. I wore my new mustard yellow shirtdress from Monki paired with my everyday Ban.do bag and favourite flats from last summer. Notes on the fit: this dress runs huge! I have another dress in an XL from Monki, and this is cut at least a couple of sizes bigger than that one. By my estimation, this dress should easily fit a UK 22/24 in the XL. After coffee, we had a wee browse at Marks and Spencer Penny Bazaar, the last remaining one of its kind and the tiniest M&S in existence! That’s a piece of living history, right there, in the form of a fully functional store where you can buy current M&S goodies. 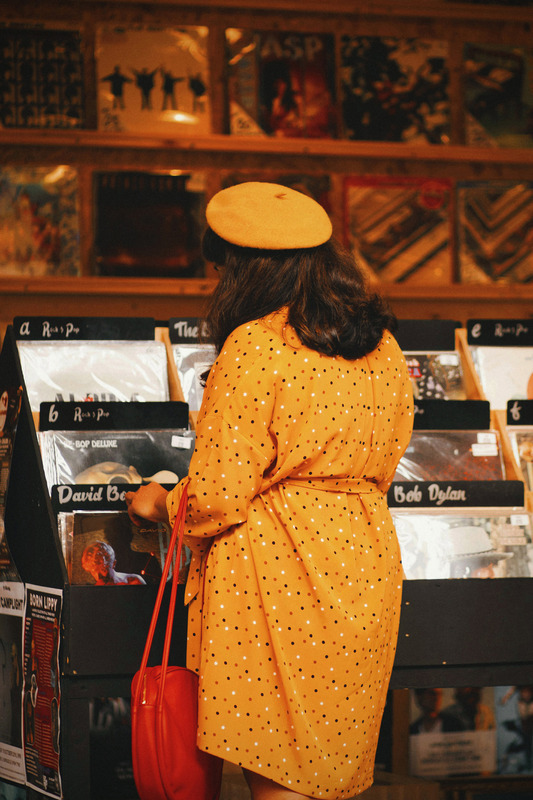 Empire Records is another Grainger Market legend, and that’s where we went next. I felt like a 15 year old once again, browsing through stacks of vinyl, and being ridiculously charmed everytime I came across a record by an artist I love. 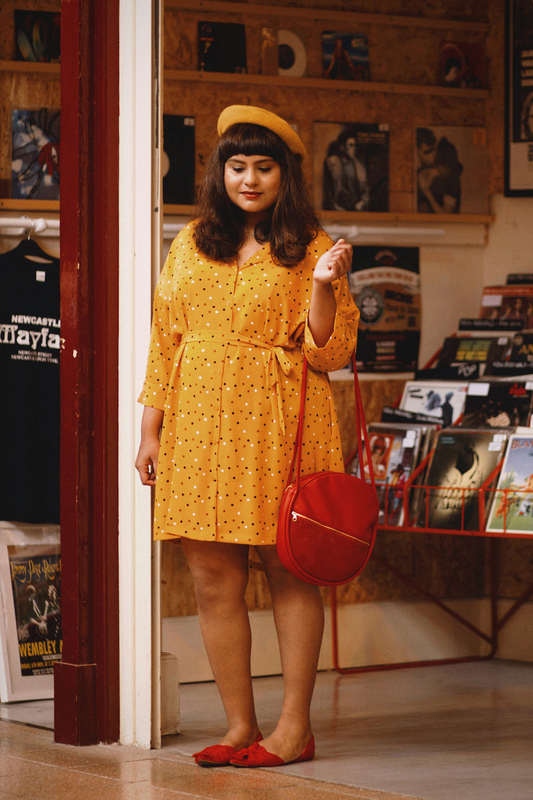 Plus size fashion blogger Ragini of A Curious Fancy at Empire Records in Grainger Market, Newcastle. 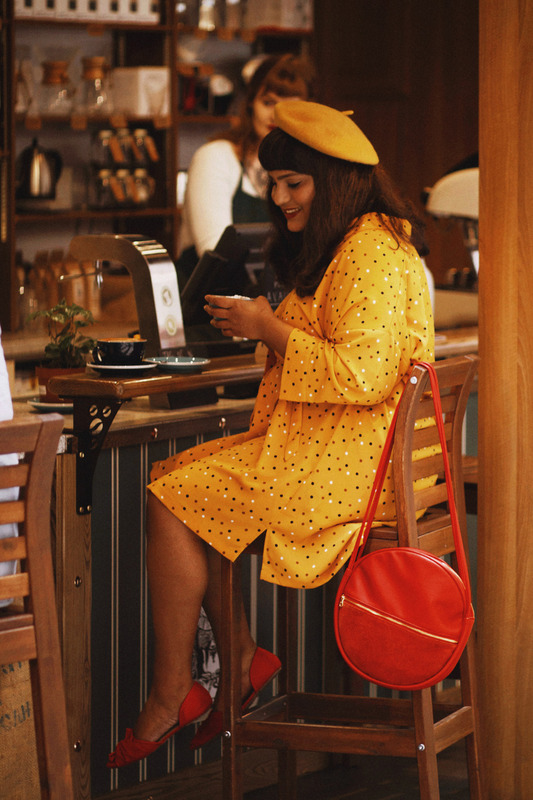 She’s wearing a mustard yellow polka dot shirt dress, mustard yellow beret and red flats. She’s carrying a red circle bag. 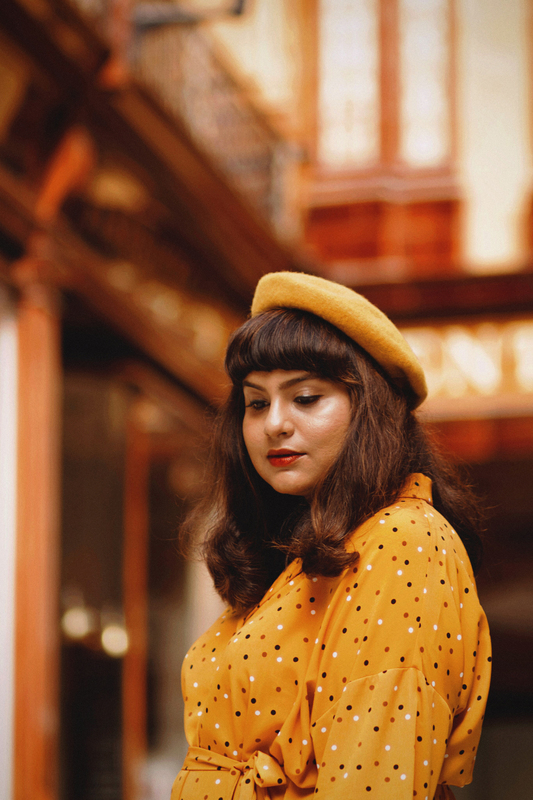 Plus size fashion blogger Ragini of A Curious Fancy at Central Arcade, Newcastle. She’s wearing a mustard yellow polka dot shirt dress, mustard yellow beret and red flats. She’s carrying a red circle bag. 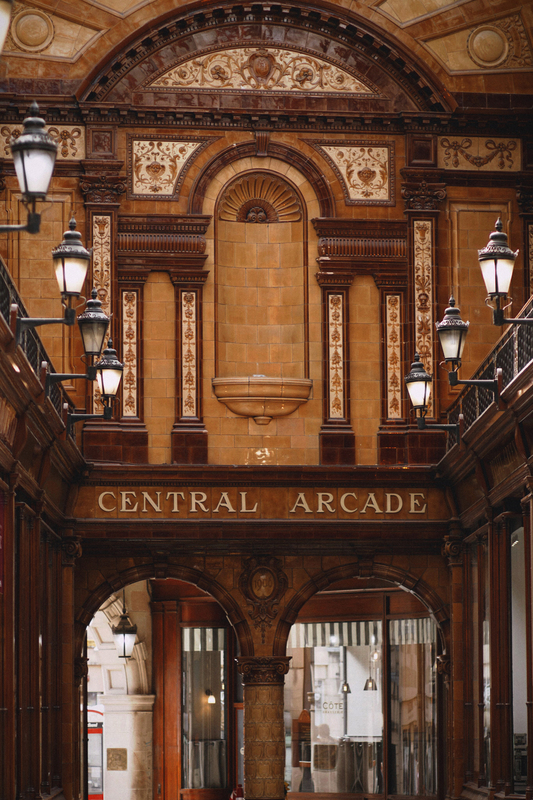 We popped over to Central Arcade for a bit, as it’s just across the road from Grainger Market. This Edwardian Era beauty never fails to inspire awe in my heart! 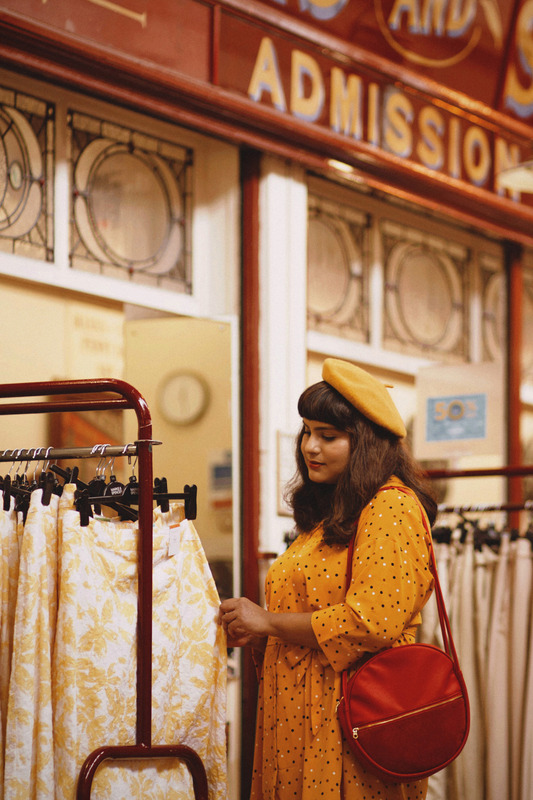 Plus size fashion blogger Ragini of A Curious Fancy at Central Arcade, Newcastle. 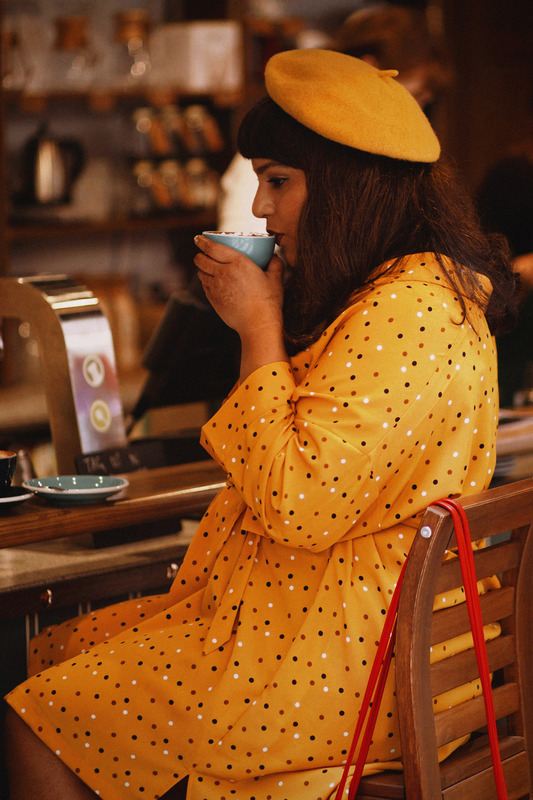 She’s wearing a mustard yellow polka dot shirt dress and a mustard yellow beret. 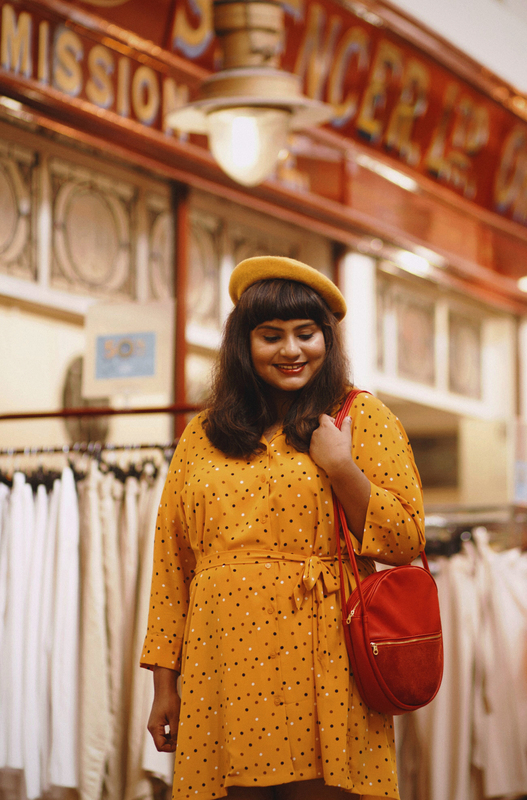 Plus size fashion blogger Ragini of A Curious Fancy at Central Arcade, Newcastle. 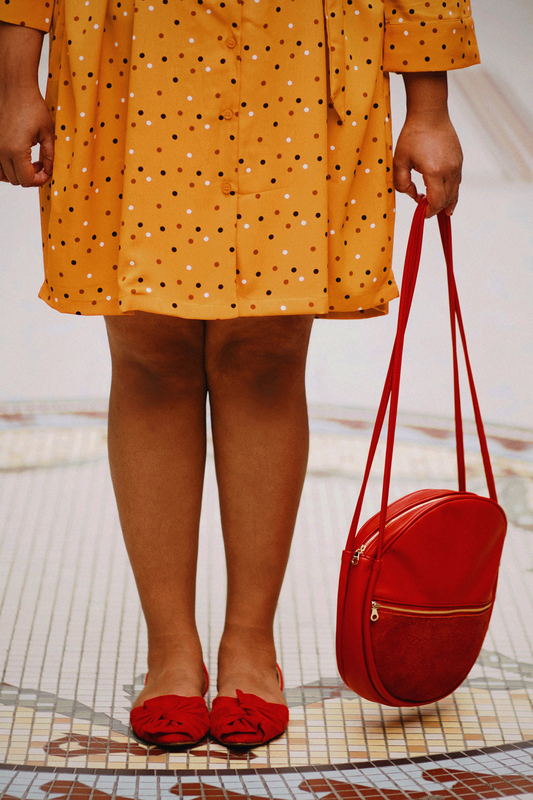 She’s wearing a mustard yellow polka dot shirt dress and red flats. She’s carrying a red circle bag. 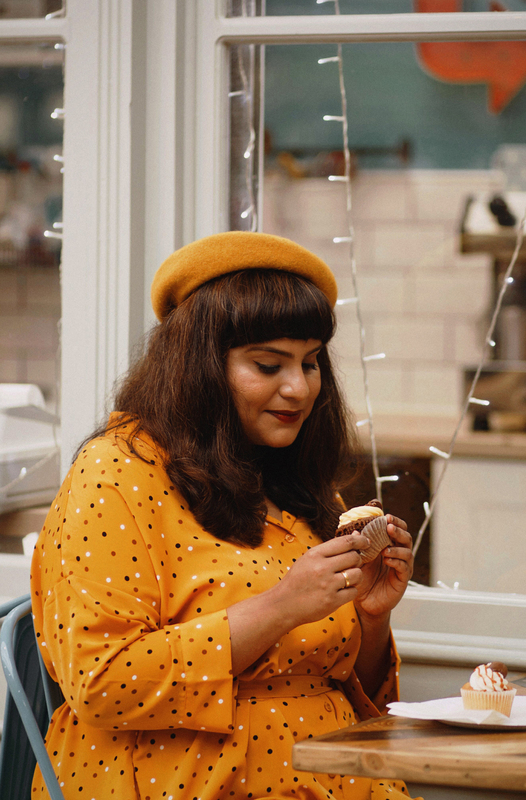 Plus size fashion blogger Ragini of A Curious Fancy at Pet Lamb Patisserie in Grainger Market, Newcastle. 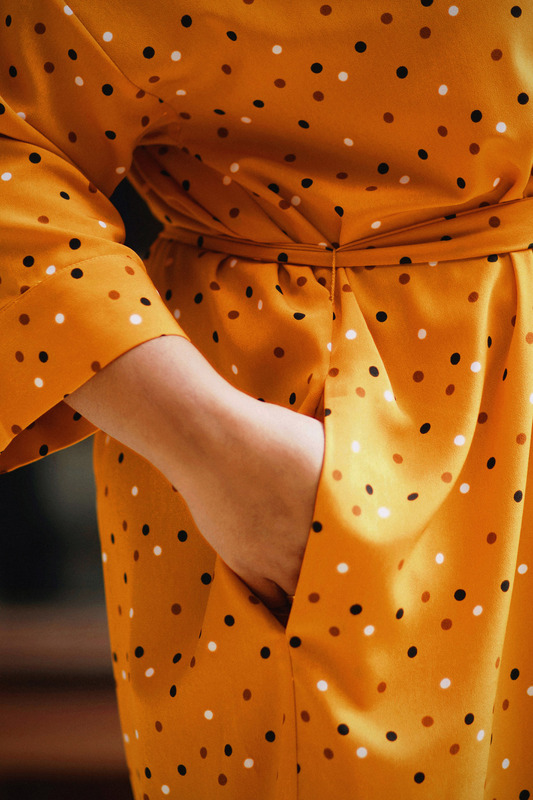 She’s wearing a mustard yellow polka dot shirt dress and a mustard yellow beret. She’s unwrapping a cupcake. Finally we stopped off at Pet Lamb Patisserie for some of their divine cupcakes. I’ve been following them on Instagram and admiring their delectable creations for years and the real thing was even better in person. Hands down the best cupcakes in Newcastle! Pet Lamb Patisserie at Grainger Market Newcastle. 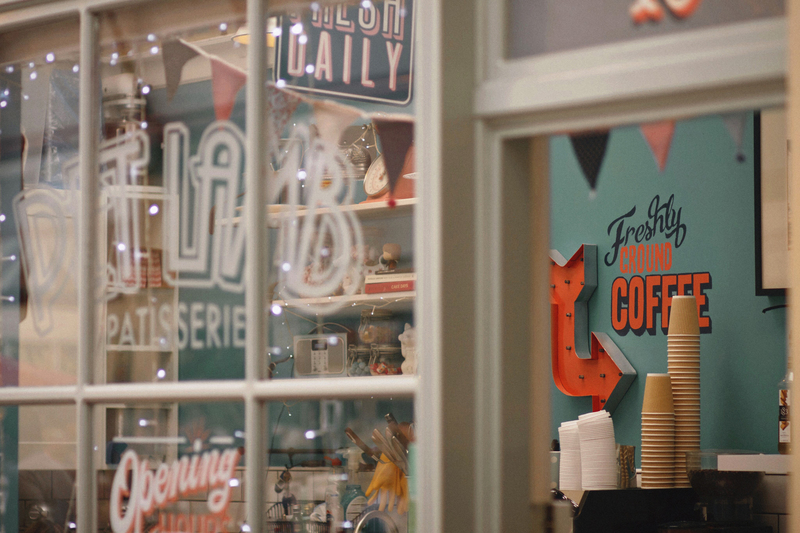 I hope you enjoyed this little tour of Grainger Market with me. I’m looking forward to exploring and photographing more of this gorgeous, heartwarming city that I’ve made my home! 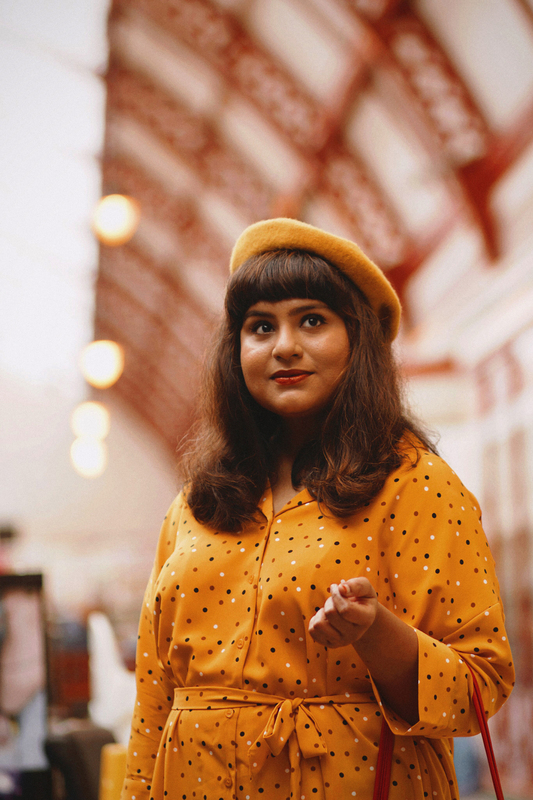 Plus size fashion blogger Ragini of A Curious Fancy at Grainger Market, Newcastle. She’s wearing a mustard yellow polka dot shirt dress, mustard yellow beret and red flats. She’s carrying a red circle bag.